Since my recent post about my new Kindle, I have been thinking a lot about technology. On Saturday night the kids and I had a chew-and-view. We ate tortellini and watched Shrek the Third, renting the movie on my laptop from amazon instant play and having it transmitted to the TV. Who needs Netflix? I don’t even need to wait for a DVD to come in the mail any more. Later that evening, having enjoyed a delicious (and very silly) twitter conversation earlier in the day about a modern-day reworking of A Christmas Carol, I downloaded the book on to my Kindle for free and read half of it there and then before I went to bed. While I read I listened to some old Ella Fitzgerald albums that I used to own in college but were lost years ago in one of the many moves that I’ve undertaken since then… that no longer matters, though, as they’re all available for limitless streaming on Spotify. There is something slightly oppressive about the fact that I am apparently unable to step out of the door in the morning without several hundred dollars of electrical hardware in my pockets. It is sad the decision to leave my phone in the office when I go out to lunch is an event worthy of a tweet (and several congratulatory tweets back.) My calendars lie, in fully-synced harmony, on my phone and my laptop. I can never escape them. I’m electronically tethered as effectively as any criminal out on day-release. Well, enough, as they say, is enough. In my new kitchen, we have decided to go old school. I bought a white board and a bunch of colored pens. And we write whatever needs to be written on it. Here’s a photo of it I took a week or so ago. I think it’s fair to say that Catherine speaks for us all about the whiteboard. We all love it and use it. In addition to being a genuinely useful tool – and heaven knows how many yellow stickies it has saved us from – it’s a communal forum, an outlet for our creative urges and silliness. We can scribble whatever nonsense comes into our heads and draw pictures and anything else that takes our fancy. The children like to insult each other on it in a way that makes it very difficult to be cross with them about it. And the beauty of it all is that it can all be wiped clean with a few swift strokes of the eraser. 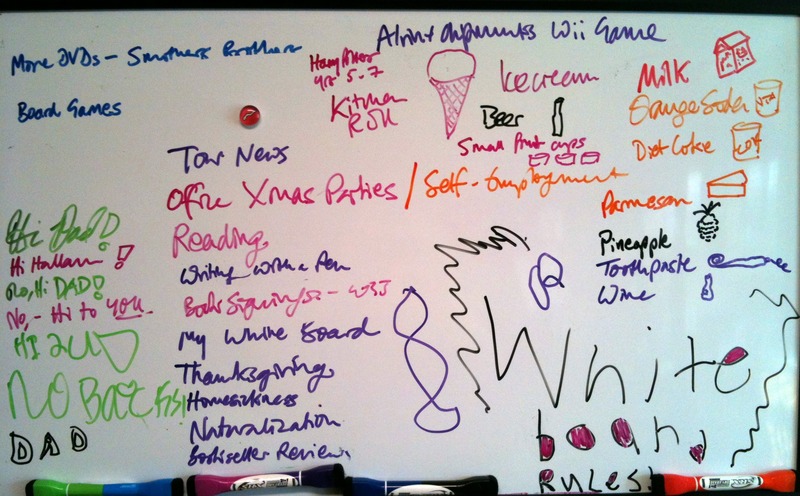 And, in this world of tapping at tiny screens, there is something pleasingly primal about both the act of writing on a whiteboard with a brightly-colored pen and then erasing those same words – it’s a physical, visceral sensation, all the more pleasurable for being completely self-sufficient. Not to brag or anything, but our whiteboard works during a power cut. We never have to call the helpline. I don’t worry about when the warranty will expire. Best of all, even a child can use it. This really hit home…. now that both kids are home for the holidays, we’re often all on either our laptops or iphones or both at the same time… sitting and watching a movie whilst typing away. When we went to get our Christmas tree, we all left our iphones at home (never talked about it, but I think we just realized it would be too distracting). It was WONDERFUL. 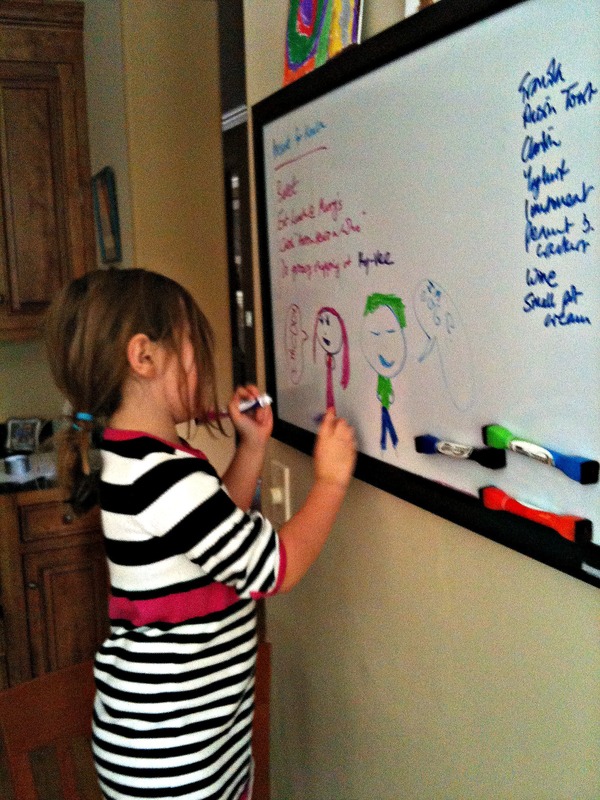 Also, I love whiteboards, and I’ve been thinking of doing the same thing… so great for the kids! Nice post, Alex! Whiteboards are great. I’m still a big fan of notebooks. And it IS sad when leaving a phone in the office is worth of Tweeting (and the congratulations that follow). I often wonder how always being connected affects one’s writing. I recently took a 101-day social media break. When people heard what I was doing, more people than not said, “I’d die without [insert preferred social media site here]!” And, at first, it was tough. A few weeks in, though, I found myself slowing down in other aspects of my life. I became more focused. The biggest thing I noticed: I started writing the best stuff I’ve ever written. Upon returning to social media, I saw my focus slip again. It’s only because of taking mini social media breaks now that I’m back that my focus has returned and words are flowing in ways I only imagined before taking the break. Excellent! You may just become responsible for an uptick in the sale of white boards around here–I hadn’t thought of bringing one home, although we rely heavily on one in the newsroom, but I just might put one under the tree…..
And you’re right about being tethered to our electronics; my husband has a phone AND a Blackberry for everyday attire (the Blackberry is strictly for work, the other is personal) and Luddite that he is, it makes him crazy!